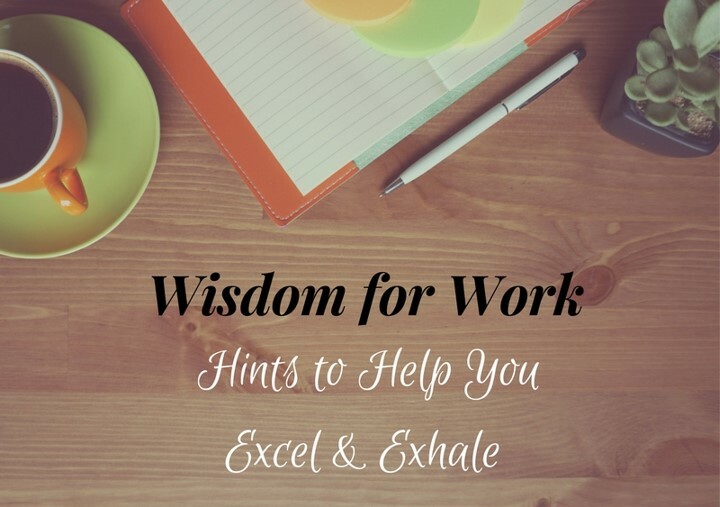 It’s time for Work Wisdom, a random collection of tips and thoughts to encourage you to excel and exhale at work! Click on the video to watch a slide show, or read the list that follows. Plan ahead, but stay present. When setting up a project, break it into small pieces, and be more generous with deadlines than you think you need to be. When using a reminder app, make your reminders pop up at odd times. This will help you be less likely to ignore the notification, or have a reminder be buried behind an appointment. You don’t have to have an extensive filing structure in email, because most email interfaces have a decent search functionality. So don’t waste time trying to maintain a too-elaborate folder system. Use a small whiteboard instead of scrap paper at your desk for quick notes/calculations. If you feel better keeping a record of the note, take a photo when done. Remember that there are times when silence is the best response. Email is not the enemy. How you manage it might be. In the body of your task reminders, add links to the resources you’ll need to complete that task. Like hints like these? How about having one show up on your calendar every day of the year? Click here to get personal access to the HOPE Hints Daily Calendar.